Bedrock Software Inc. is planning the release of AggOpti in 2018. AggOpti is a new AggFlow feature that will enable producers to match a plant simulation to a sales forecast and solve for the most effective schedule to give the highest efficiency and revenue. AggOpti will show by plant stage the achievable and shortfall sales, inventory changes, plant production and plant running costs by month for the sales forecast period. “What we have found over the years is that operators can guess at their plant’s efficiency, but most don’t really know the true percentage. We boil it down by asking this: ‘How efficient is your plant? AggOpti can tell you that. How efficient can it be if you run it differently? AggOpti can tell you that, too,’” says Bedrock Software President Bryan Lewis. He explains that if the plant is not capable of achieving a desirable efficiency through its operating modes, the user can add different equipment into the simulation, and export the data again to calculate “what if” scenarios for improving efficiency. We intend to have AggOpti available through a regular AggFlow update by mid-2018. With this update, you will notice the launch of the new, easy-to-use feature. AggOpti, which will be available within the online AggFlow DM program as a menu item (see graphic), is being designed to use producers’ plant production data, sales results and forecasts to calculate both their past and optimum plant efficiency. AggOpti will show producers how they can improve their efficiency moving forward. The new feature will be available for all AggFlow DM users. AggOpti is based on an AggFlow plant simulation that licensed users will build with all stages and operating modes included for their plant. 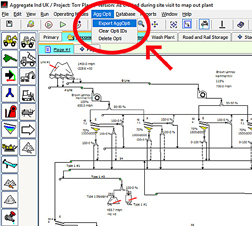 The user exports the simulation results to AggOpti using the menu option from the worksheet to upload stage and mode production results and actual measured production rates from the AggFlow simulation. Once this information is in their AggOpti database, it then allows users (with permissions) to open AggOpti as a web-based application to access and manage a forecast plan based on the AggFlow plant simulation results. The AggOpti application enables users to enter sales forecast and plant operating conditions and solve for the best combination of operating modes to meet the sales forecast while achieving the highest efficiency and revenue possible. Future planned improvements to AggOpti will include the ability to enter past data to show how efficient your plant has been operated and show past availability and utilization percentages. With AggOpti, producers can better schedule production, and easily set KPIs to track and ensure that sales commitments can be met. AggOpti will be ideal not only for producers, but also for manufacturers and dealers who use AggFlow to help their customers achieve greater efficiency in their plants. For more information on AggOpti, contact AggFlow at sales@aggflow.com. Include “AggOpti” in the subject line.